Whether you're seeking powerboats, paddleboats, sailboats, yachts, or other types of boats; you can rent a boat in NY with the help of Fun New York's helpful guide. Find New York boat rentals in the five boroughs and other parts of NY. See our list of NY boat rentals that will help you explore the unique wonders of the great state of NY. Rent a Fishing Charter in NY! If fishing is your specialty, you will love the boat rentals at Lady L Charters. For over 40 years, Lady L has been providing NY residents with the best in charter boat fishing. Whether you're looking to go trophy striped bass fishing or simply want to enjoy a relaxing day on the water, you will not be disappointed by these NY boat rentals! You can rent a boat for the full day, half the day, 1/3 of the day, or early morning before you head off to work. Feel free to call beforehand to get up-to-the-minute fishing reports. The fishing charters are perfect for family and corporate outings. 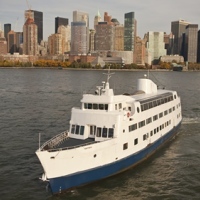 Fun Yacht Charters in New York! Hennessy offers excellent yacht charters for all types of corporate and private events. Climb aboard one of these classically designed yachts and experience the most stunning views of New York. Whether you're planning a cocktail party reception, a casual brunch, a lunch, or an upscale cruise--these yacht rentals will suit all your needs. For affordable rates, you'll get to rent a yacht for a minimum of 2 hours, with an experienced captain leading the way. Amenities like food, beverages, and grills are available for additional fees. Beautiful Boat Rentals in NY! 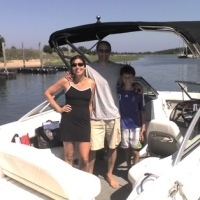 Perfect for families and friends looking to experience the pleasures of boating, Long Island Boat Rentals strives to make boating as affordable and enjoyable as possible. In this way, you can experience the joys of cruising the waters, without dealing with the hassles and expenses of boat maintenance, winter storage, and docking. You must be 18 or over to rent a boat and prior boating experience is preferred. Rental hours are from 9 A.M. to 8 P.M. each day. A security deposit is required prior to your boat's departure. Browse the website to view all the beautiful boats you have to choose from! Enjoy a Most Pleasurable Boat Ride through the City! As New York's premier sailing destination, Atlantic Yachting is a family-run sailing company that offers private sailboat charters, group and private sailing lessons, and a sailing camp for kids. Experience the wind in your hair and the smell of the ocean, as you explore the Statue of Liberty, the Brooklyn Bridge, and other spectacular NY landmarks. 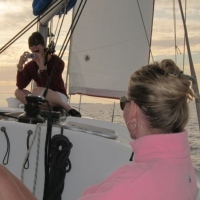 Luxurious private sailboat charters are available for groups of up to six people anytime day or night. Sail to your heart's content, sunbathe, sight-see, soak up the sunset, stare up at the stars, or engage in many other fun activities. Due to its outstanding New York boat rentals, the company has received a slew of glowing reviews as well as numerous repeat customers. 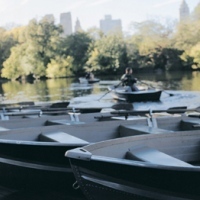 Explore Central Park via Rowboat or Kayak! Located in New York's Central Park, The Loeb Boathouse allows you to explore the massive and beautiful park from a unique perspective. Choose from a fleet of 100 rowboats and 3 kayaks. All boat rentals are available from April until November (weather-permitting) from 10 A.M. until dusk. All boats hold up to 4 people and the rental rates are affordable. For safety purposes, the boathouse will provide you with life jackets. Children under the age of 12 must be accompanied by a parent or adult guardian. Enjoy Boating and Fishing in NY! 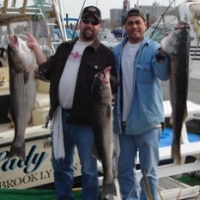 Enjoy trophy class striped bass fishing at its best when you rent a boat from Angler Charters. 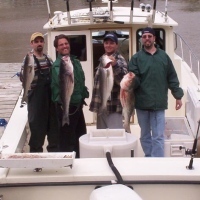 The company boasts over 25 years of experience on NY's greatest fishing waters. Angler Charters' mission is to provide you with a spectacular time on the water and plenty of fish! With top quality equipment and a well-maintained vessel, you will not be disappointed. With shelter from the wind and rain, the boats are perfect for fishing in any weather conditions. Other than striped bass; you can fish for fluke, bluefish, weakfish, tog, and sea bass. Since Angler is a family-oriented business, children are always welcome. Rent a Hydrobike, Rowboat, or Paddleboat in NY! Located in Flushing Meadows Corona Park, Flushing Meadows Lake Boathouse allows you to rent hydrobikes, rowboats, and paddleboats. The boat rentals are popular amongst tourists and locals alike, allowing you to enjoy a relaxing boat ride as you indulge one of the most beautiful parks in New York. Boating season is from August through September, and you can rent a boat anytime between 9 A.M. and 8 P.M. (weather-permitting). The boat rentals are free before noon and between $15 and $25 per hour afterwards. Full Day and Half Day Boat Rentals in NY! Rent a boat in New York for half the day or for the whole day at New York Sailing Center & Yacht Club. Boats with engines are available for overnights. All boats are equipped with fixed mount or hand-held VHF radios. To rent a boat, you must demonstrate the ability to read a chart, rig a boat, sail it, and use an engine (if applicable). Check the website for the list of rental/charter rates. If you're planning to rent a boat for the weekend, it's suggested that you make your reservation by mid-week. For weekday boat rentals, you should do so about a day or two in advance. 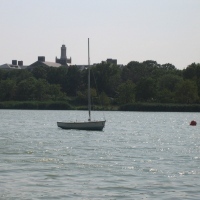 The sailing center also provides some of the finest sailing instruction in NY for affordable prices. 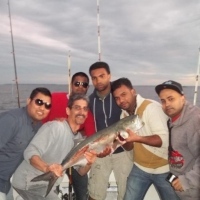 Enjoy a Memorable Fishing Trip in NY! Enjoy a private sportfishing adventure while aboard a relaxing, 32-foot Silverton Cruiser at Just Wonderfil Sport Fishing. The boat is equipped with twin crusader engines that provide 440 horsepower, the latest electronics and backup systems, a fully-enclosed and spacious cabin, comfortable seating both inside the cabin and out on the deck, fresh running water, a clean bathroom, and all the required U.S. Coast Guard safety equipment. Let Captain Phil Bentivegna lead you on a safe, fun, and exciting fishing expedition. Captain Phil will be more than glad to tailor the trip to fit your party's needs. The NY boat rentals are ideal for sightseeing, wreck/research diving, family fun, corporate fishing, and various special events. Rent a Boat in NY for a Day, a Week, or Longer! Offering boats for rent in New York for over 14 years, Strong's Marine gives you the perfect opportunity to enjoy a soothing day on the waters by allowing you to rent a boat for a day, a few days, a week, or more without any long-term obligation. Choose from the list of newer 19' to 24' models. If you feel like your boating skills aren't up to par, Strong's offers informative boating lessons. Let the first-class instructors help you gain confidence on the waters through safe boat handling. Also, captain services are available for all boat rentals. Check the website to view the complete rental fleet, as well as boat rental rates. Affordable Boat Rentals in New York! Marco Polo Cruises offers beautiful New York boat rentals, with a list of packages to accommodate both your personal and budgetary needs. The Halfmoon boat rental is a 80-foot long vessel that seats 90 people. The largest boat rental, the Jewel, is 120 feet long and seats up to 150 people. All four U.S. Coast Guard certified boat rentals contain a full-service bar and two decks. For a free pricing quote, call 212-691-6693 or log onto the website. Marco Polo also offers delightful cruises for such events as proms, school events, graduations, birthdays, corporate outings, weddings, fundraisers, family reunions, Sweet Sixteens, 4th of July, and New Year's Eve. 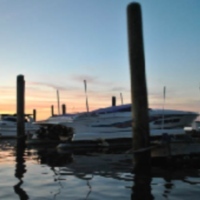 Rent a Boat at this Gorgeous NY Marina! Rent a 16-foot Carolina skiff with 6 horsepower out board motor at the Bayside Marina in NY. All gas and safety equipment are included with your rental. Boat rentals are available on a first come first service basis. If you plan on going fishing while out on your boat, you can rent a fishing pole at the fully stocked bait shop. Rental hours are from 9 A.M. to 6 P.M. everyday. All boat rental customers will be given temporary parking permits. When you get hungry, feel free to stop in at the full-service snack bar--serving breakfast, hot dogs, hamburgers, french fries, soda, beer, and much more. Climb aboard "The Ultimate Fishing Machine"! 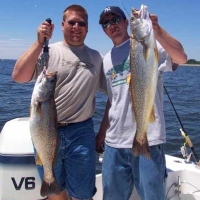 Fish for striped bass, bluefish, weakfish, and false albacore while aboard one of On the Bite's fishing charters. All charters are located within minutes of the NYC and New Jersey waters. Fish the waters of Raritan Bay, Sandy Hook, NJ; Jamaica Bay, and New York Harbor. Embark upon your journey on "the ultimate fishing machine"! The Ocean Master 31 is powered by twin 250 HP E-Tec engines, achieving a top speed of 50 miles per hour. 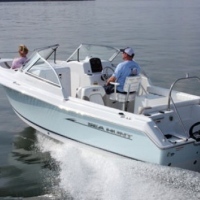 The boat features state-of-the-art electronics with a 3-D fish finder and chart plotting technology. All fishing trips are led by Captain Joe Mattioli, who's been fishing the NY Bight for over 25 years! A Diverse Fleet of Rental Boats in NY! 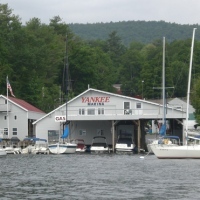 Whether you're looking for a peaceful fishing trip, a nice sail through the islands, an enjoyable day with the family, or high performance water sports; Yankee Boating Center contains boat rentals that will fit your needs. Browse through one of the most diverse fleets of rental boats, all of which are maintained for your safety. Explore the crystal clear waters of Lake George and the lush mountain scenery on one of the high performance sailboats. Or enjoy a slew of great outdoor activities on one of the power or pontoon boats. You can also rent water sports equipment like single or double tubes, water-skis, or waterboards.